So let me start by saying I do not enjoy painting. Not even a little. Due to our high ceilings, we had to hire someone with a very big ladder to paint the main areas, but we did take on some of the smaller ones. Since this chore is at the bottom of my love pile, I needed all the painting hacks I could find! I’ve collected some tips to make this chore much easier that save loads of time. As I mentioned, when we bought our new house, the first project was all of the main living area painting. Little did I know when deciding that we wanted gray how many shades of gray there are (let me tell you, it’s definitely more than 50!). There is blue-gray. Green-gray. Brown-gray. Lavender-gray. Basically every color in the crayon box-gray. So picking out our paint that would be in the majority of the house put us in quite a pickle! As we’ve all seen on Pinterest, the swatches in those paint chips you get from Sherwin Williams can be made in to all sorts of cute crafts. What they don’t do is give you a real idea of what the paint color is going to look like on your walls. It’s all about the sample jars! 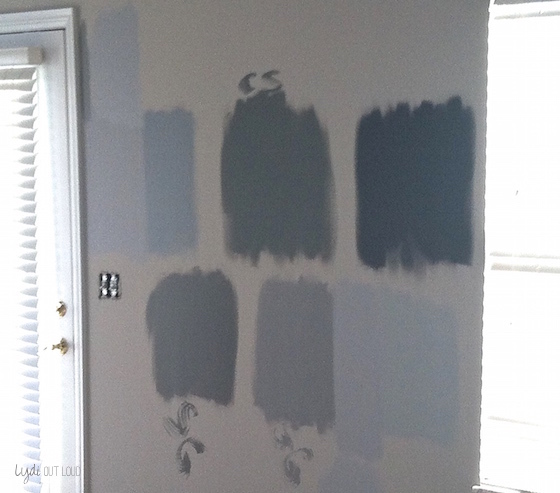 Apply paint swatches of the colors you’re considering on to the areas that you will be painting is a MUST! There are so many factors that will impact the way the color looks: lighting, surrounding wall colors, floor color, etc, the direction your home faces, etc. Put a couple of coats on the walls and look at them at different times of day to see how they look with different lighting levels. The couple bucks you invest in paint samples will save you much frustration and money (when the color ends up looking horrid in real life!) See how different all of the colors are below? I would have been not very happy with almost all of them, although I loved them in the paint deck. 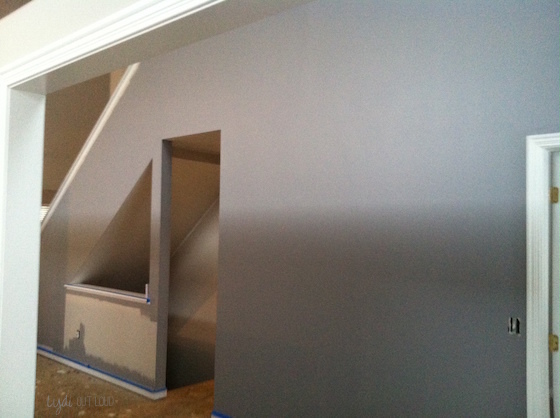 Below is the gray we decided on (please pardon the midday shadow). What do you think?